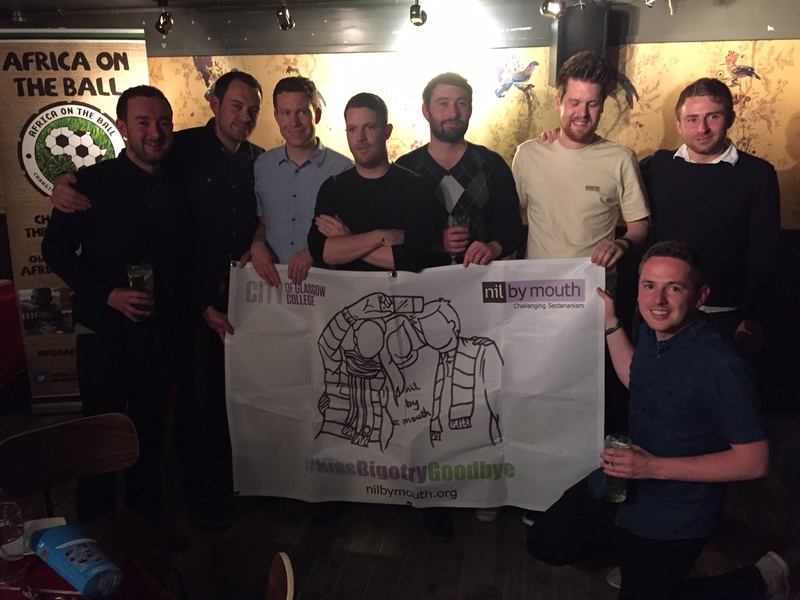 Saturday 25th June saw the final date of our 2015/16 ‘Kiss Bigotry Goodbye’ tour of Scottish football clubs and fans groups. Broadcaster and author Daniel Gray entertained the audience with exclusive readings from his new football book, which is to be published in the autumn. After a ‘Q&A’ featuring guests reminiscing about their favourite football memories the audience competed in the cult Kiss Bigotry Goodbye football quiz including rounds on the Scotland National Team, African Football and The European Championships. “Some of the most iconic figures in football history hail from Scotland and the game is a hugely significant part of our culture. The behaviour of football fans can often attract negative headlines but we know that the vast majority of fans simply want to support their team and enjoy the beautiful game. There are many brilliant people involved in the game who run supporters buses, wash kits, drive kids to matches, coach teams free of charge and work behind the scenes at our clubs. This tour was a celebration of them and a chance for us all to focus on how the game brings people together each week. We all have our different teams and differing opinions, but we’re all united by this love of the game, and its eccentricities. Sometimes it’s easy to forget the joy, and forget that football isn’t always the problem – it can be part of the solution.